NOTICE: Activation key must be used on a valid Steam account, requires internet connection. 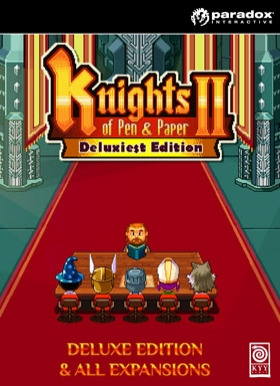 DELUXIEST EDITION	We are proud to present the new Deluxiest Edition of Knights of Pen & Paper 2, an all-inclusive bundle. Players will get the base game, its three expansions - Fist of +1 Fury, Here Be Dragons and Back to The Source - and a wealth of bonus content! The bundle includes: Knights of Pen & P… aper II (base game) Fist of +1 Fury (expansion) Here Be Dragons (expansion) Back to the Source (free expansion) An Epic Mount to carry you through your mounting epic An Art Book for the true pixel connoisseur An Exclusive In-Game Location: The Grinding Farm A 14-song Soundtrack, full of tunes best experienced with chips	ABOUT THE GAME	Prepare to join Knights of Pen & Paper 2 in a turn-based, retro style, pixel-art adventure full of danger, intrigue, and semi-appropriate cultural references! Assemble your party and control your group of pen and paper role-players as they are guided through their adventures by the Game Master. All the fun of pen and paper RP, none of the lost dice! Now including races like Dwarf or Elf, assemble the party of your choice, choose quests and combat encounters, delve into dungeons, craft powerful items, and complain loudly to the GM!KEY FEATURES Play a group of pen and paper gamers playing a pen and paper role playing game Punch a Panda! Explore your anger management issues in the Fist+1 Fury expansion! Create your own characters, how about a Rocker Dwarf Warrior or a Cheerleader Elf Monk More contemporary geeky jokes than you can stuff in a CAVE! Gotta catch them all! Lots of monsters, equipment, a crafting system, and things to customize. There's no paying your way to victory here! Start with all of the content, unlock it with the blood, sweat, and gold coins, of your party! Customizable hot keys, Steam Controller and Gamepad support SYSTEM REQUIREMENTS Windows: OS: Windows XP or later Processor: 2000 MHz Memory: 512MB RAM Hard Drive: 100MB HD space Graphics: 640x480 minimum resolution (Direct3D/OpenGL compatible card with at least 128MB) Sound: 2D sound compatible card DirectX®: 9.0c Mac: OS: OS X 10.4 or later Processor: 2000 MHz Memory: 512MB RAM Hard Drive: 100MB HD space Graphics: 640x480 minimum resolution (Direct3D/OpenGL compatible card with at least 128MB) Sound: 2D sound compatible card DirectX®: 9.0cLinux: OS: Ubuntu 10 or later Processor: 2000 MHz Memory: 512MB RAM Hard Drive: 100MB HD space Graphics: 640x480 minimum resolution (Direct3D/OpenGL compatible card with at least 128MB) © 2015 Paradox Interactive™. Trademarks belong to their respective owners. All rights reserved.